Century Cycles has been proud to support the Bike MS Pedal to the Point for every year since we were founded 23 years ago. In 2014, we formed our first-ever shop-sponsored team for the event, and it was a huge success, with 42 team members who raised over $20,000 for the local Ohio Buckeye Chapter of the National MS Society. The bike tour returns in 2015 with a new name, new route, and new destination as the Bike MS Buckeye Breakaway. The two-day 150-mile ride on August 1-2, 2015 still starts in Brunswick, Ohio, with the overnight stop at Ashland University in Ashland, Ohio. One-day ride options of 30, 75, or 100 miles are also available. 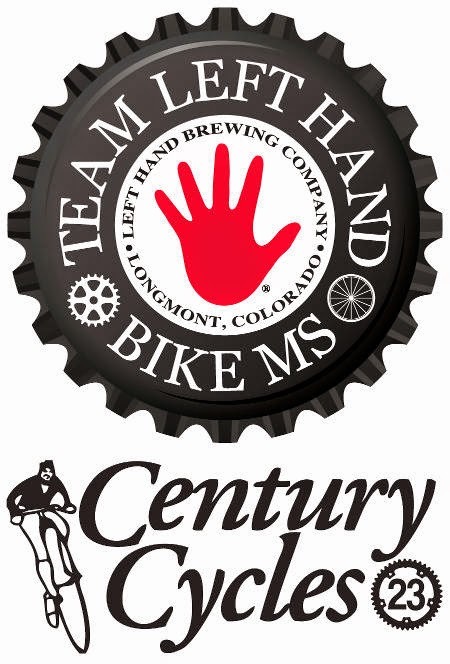 Century Cycles steps it up a notch this year by joining forces with the Left Hand Brewing Company of Longmont, Colorado to form Team Left Hand/Century Cycles! In their eighth year of riding, Team Left Hand consists of riders from across the U.S. who volunteer their time and effort to help the National MS Society fund research, advocate for change, and help people living with MS. Team Left Hand has participated in Bike MS events in Colorado and North and South Carolina, Florida, and for the first time, Ohio. "Bike MS isn't just a two-day event; it’s an enduring commitment to making a difference in the fight against MS," states Chris Lennert, Left Hand's national Team Captain. The team’s inspiration lies in the friends and family afflicted by Multiple Sclerosis, motivating each member to work towards their personal goal of raising at least $1000 a year. Scott Cowan, Owner of Century Cycles and Captain of Team Left Hand/Century Cycles, adds, "We are going to be a formidable team! Everyone here at Century Cycles and all of our riders are really looking forward to the collaborative efforts at hand (pun intended) and welcome Left Hand Brewing to the Buckeye Breakaway!" Membership in the team is open to the public for anybody interested in participating in the Bike MS Buckeye Breakaway ride. Team Left Hand/Century Cycles members will have access to exclusive team benefits, including wearing the custom one-of-a-kind team jersey, a team masseuse, and priority access to the Left Hand Brewing Company post-ride celebration tent located at Ashland University on August 1. A team kick-off party, movie night, and training rides throughout the upcoming season are also planned. The Team Left Hand/Century Cycles Kick-Off Party is open to the public, and attendees will have the opportunity to meet and talk to current team members from both Century Cycles and Left Hand Brewing company, and get more information about joining the team. A Very Fat Tire Weekend!